If you've read these pages at all, you know that we're big fans of keeping both weight and costs low. Sure, we have a couple of expensive items that are really light, but we also have a ton of stuff that didn't cost much, and is as light as anything you can buy. And some of that stuff we made ourselves. On our recent trip to the Emigrant Wilderness, we were particularly pleased with the pot cozy that P made out of some old closed-cell foam. It's pretty darn simple--just a cylinder and a lid, to match the pot--but it kept our freeze-dried dinners piping hot for the full fifteen minutes that we left them to re-hydrate. It worked perfectly. And it cost us nothing. And it weighs almost nothing. That's it upper right in the photo below, with it's silver foil outer covering that P cut out of a insulated package he got in the mail. 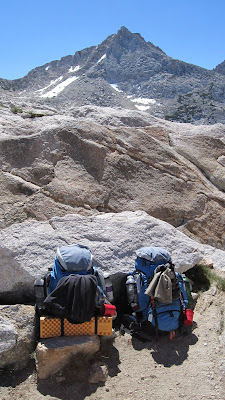 Sadly, M forgot her closed-cell foam seating pad that she always tucks into the straps on the back of her pack. We use these as seats on the trail, as they are a lot softer than a rock. They cost nothing, and they weigh nothing. M also uses them as a windbreak for the stove on breezy evenings. When we are pumping water, they give us just enough cushion to keep our bones from aching. This trip we had to share, as M left hers at home! You can see one of these below, curled up a bit in front of M. She's sitting on the other one. We also tied on a quick net of elastic cord on the outside of our packs, so that we can put a fleece jacket, our crocs, or one of these pads on the outside of the pack. We paid less than $2 for the cord, and it makes a huge difference on the trail. In the photo below left you can see how these work, with crocs, pant legs, foam seats, and fleece all held in place by this convenient cord. And you can add to that our cutting board, a 4x6 inch square cut from a larger flexible plastic cutting board we bought at a local gourmet deli. Net cost/ Under $5, and a perfect lightweight solution to either cutting your leg with the knife, or cutting salami on a rock...and leaving the edge of your knife as dull as conversation with the rock itself.